Our VPH transmission grating technology is at the heart of everything we do. Here, we share the many advantages of transmissive volume phase holographic gratings over reflective ruled gratings, and how we make the most of each one! gelatin sealed between two optical windows. 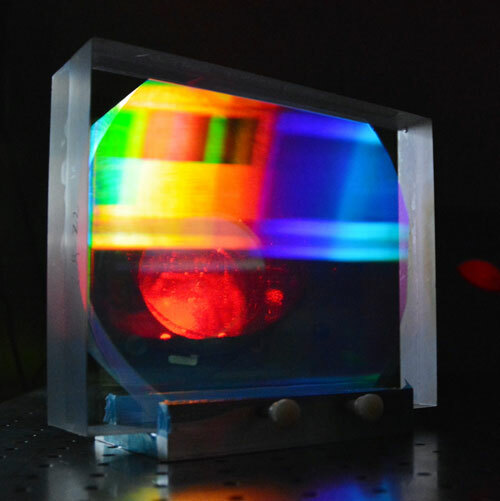 It’s a process that allows us to generate very high quality diffraction gratings in volumes of 1 or 100 pieces. With no “master grating” to wear out, we can deliver consistent performance from one grating to the next over long periods of time without degradation from copying. As originals, we can also customize and optimize our gratings much more easily and cost-effectively for each application. 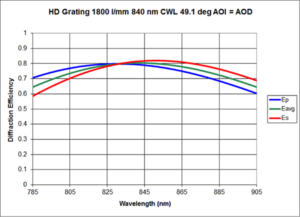 200-300 nm bandwidth to >99% for a single wavelength for Bragg conditions. This is up to 40% greater than reflective surface relief gratings, which can have very jagged, asymmetric efficiency profiles that wreak havoc with system response. A VPH grating’s efficiency varies smoothly with wavelength, and can be modeled at the design stage for inclusion in system performance models, and then manufactured dependably based upon that design. The encapsulated nature of our VPH gratings also allows the application of high‐performance, anti-reflection (AR) coatings on the surfaces of the element. These coatings offer further optimization of performance, and can be customized as needed for OEMs. We draw on our multiple patented design technologies to optimize each grating to its application, from stock gratings for R&D to custom gratings for our many OEMs and unique applications. We utilize three distinct design technologies to optimize our gratings to your needs, and can deliver uniform efficiency over bandwidths up to 200-300 nm. Learn more! VPH gratings can be reliably generated with higher line densities than ruled gratings, delivering high quality gratings with low ghosting and scatter at line densities ranging from 150 to near 6000 lines/mm. The flexibility of our manufacturing process allows us to easily customize the line density and wavelength of operation for your needs. Reflective gratings typically offer much lower efficiency for p-polarization than s-polarization, often with very different efficiency response between the two states. This is particularly evident as the line frequency of the grating increases. VPH gratings are far less sensitive to polarization, with the added benefit that the polarization response is both smoothly varying and well understood. We offer several design solutions, including our patented Dickson and HD gratings, which allow us to minimize and/or optimize polarization response specifically for your application. A transmission grating is a very simple way to make an optical design more compact, as transmission gratings can be designed to work in the Littrow configuration (Ɵd = Ɵi). 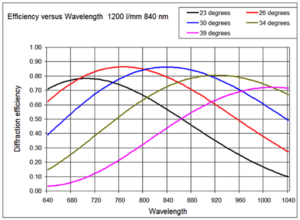 In general, transmission gratings offer the optical engineer more geometry options, whether designing a pulse compression system or a spectrometer. The net result is that a system designed around a Wasatch Photonics VPH grating is likely to be smaller, lighter and less expensive than one designed around a conventional reflection grating, in addition to being easier to align. 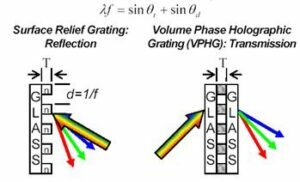 Transmissive VPH gratings operate on the principle of diffraction of light, allowing the grating efficiency curve to be “tuned” in center wavelength simply by varying the angle of incidence (AOI). This allows a single grating to be angle-tuned to study spectral features of interest in different ranges, a common technique in astronomy, where very large gratings can be required for large scale telescopes. Ruled gratings are prone to “ghosts”, or light focused in the dispersion plane due to periodic ruling errors. VPH gratings can be designed to eliminate ghosting, while providing 10x less stray light than ruled gratings. Combined, these reduced losses translate into optimal 1st order diffraction efficiency for a VPH grating. The optically active portion of a VPH grating is sealed between 2 substrates, creating a very robust component that offers excellent thermal stability and environmental performance. Many of our gratings have been in service for 10+ years with no signs of degradation, while others have been deployed at near cryogenic temperatures. This allows our gratings to be used in a wide range of applications, from laser pulse compression, spectroscopy, and biomedical devices to astronomy. Everyone knows never to touch a ruled, reflective grating, as they cannot be cleaned – every speck of dust or fingerprint must remain, as the scratching that would occur from “cleaning” would be worse than the contamination itself! In contrast, our encapsulated VPH gratings can be handled and cleaned like any other glass optical component, making them much more manufacturing-friendly and eliminating replacement costs. More Size Options – Go Big! VPH gratings can be made much larger than one might expect – in fact, we routinely manufacture custom gratings up to 300 mm in size for astronomical spectrographs (larger sizes upon request). In addition, we can manufacture using many different types of glass materials, the most common substrates being N-BK7 or equivalent, B270i, and fused silica (UV optional). We stand behind the quality of our optics with advanced interferometric measurement capabilities for critical applications like laser pulse compression, optical coherence tomography, and astronomy. Our metrology lab sports a new state of the art Zygo Verifire™ capable of measuring up to 4” optics! When the founders of Wasatch Photonics began writing volume phase gratings in dichromated gelatin over 40 years ago, it was because they knew VPH grating technology had the performance, flexibility, and ability to scale from prototype to volume for a wide range of applications. Since then, we’ve worked hard to offer the quality and consistency you should expect from an experienced volume gratings supplier. Contact us to discuss your unique needs today!